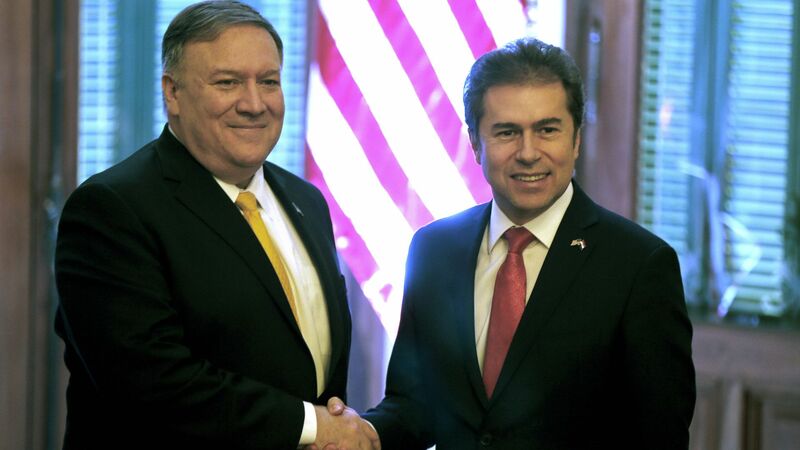 Pompeo's Paraguay visit signals heightened regional stakes for U.S.
Mike Pompeo's visit to Paraguay last weekend — the first by an American secretary of state in half a century — marked a new turn in the U.S. relationship with a country long seen as a friendly backwater. Why it matters: Paraguay has taken on greater strategic importance in light of new hemispheric issues: the Venezuelan crisis, China’s rise in Latin America and the Trump administration's efforts to build ties with conservative governments across the region. A key member of the Lima Group countries that are pressing for democracy in Venezuela, Paraguay repudiated the fraudulent re-election of Venezuelan leader Nicolás Maduro in May 2018 and quickly recognized the interim government of National Assembly President Juan Guaidó in January. Paraguay remains the only country in South America to diplomatically recognize Taiwan — and not the People’s Republic of China — as the legitimate government of China. This stance is at odds with most of Latin America and the world, including the United States, yet Pompeo hailed the people of Paraguay for "standing up for their own interests and beliefs by supporting a democratic Taiwan." Paraguay’s new president, Mario Abdo Benítez, who assumed office in August 2018, is part of a cluster of conservative leaders who have recently taken power across South America: Argentina’s Mauricio Macri, Chile’s Sebastián Piñera, Colombia’s Iván Duque, and Brazil’s Jair Bolsonaro. The Trump administration has taken this opportunity to beef up its regional policy messaging around combating leftist governments in the hemisphere. The bottom line: Pompeo’s visit underscores that the Trump administration will leave no stone unturned in its efforts to diplomatically corner Maduro, combat Chinese influence and bolster ties with like-minded allies in the region. Daniel P. Erikson is managing director at Blue Star Strategies and a senior fellow at the Penn Biden Center for Diplomacy and Global Engagement.